While he has regularly placed in the top 10 in MABRA and other cyclocross events, 2009 marks his last season as a Cat 4 Cross racer — with two wins and several top 3 finishes he’ll be required to move up to the Cat 3 race in 2010. 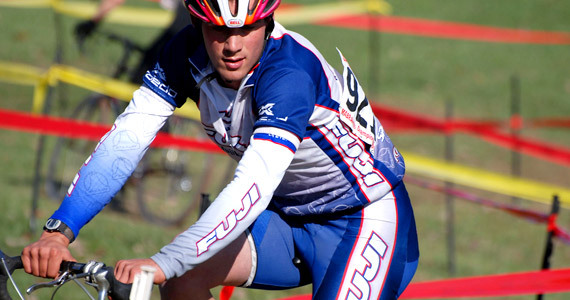 Lea has been competing since he was a child in USA Cycling and UCI International events as a Cat 4 Cyclocross Racer, a Cat 4 Track Cyclist and a Cat 5 Road cyclist. He’s just returned from December’s Cyclocross National Championships in Bend, Oregon, where snow and ice conditions created a spectacularly challenging race course. With over 150 riders in most events, Lea finished respectably in the pack of (non-disabled) men in the Cat4 race and the Single Speed event. Lea is currently ranked 2nd in the Inas world rankings of cyclists with intellectual disability following a 5-medal performance at the 2009 INAS Global Games 5-day cycling stage race.